Modern desktop (or flatbed) scanners have glass pane (or platen), under which there is a moving light (often xenon or cold cathode fluorescent) which illuminates the pane, the image of which is reflected onto a charge-coupled device (CCD) with three rows (arrays) of sensors with red, green, and blue filters. Some scanners have a lock on the moving light track to protect it from damage during shipping or moving. This lock must be released before the scanner will operate. Standard procedure for troubleshooting anything is to first check (actually double-check) the obvious. Was the scanner installed properly? Scanners require a number of drivers, including "Twain" drivers to be installed. Is the scanner cord plugged in an AC outlet, and is the outlet live? Is the USB cable pushed in all the way, and is it inserted in a proper port? Is the scanner turned on? Did the Scanner Initialize Properly? It requires a lot of communications between the PC and scanner to get it initialized properly. If you started them both at the same time, there my have been an initialization error. Try restarting the PC with the scanner connected and turned on. 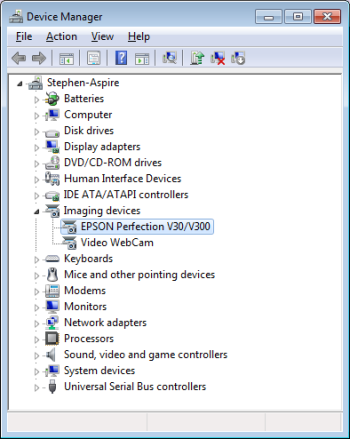 The PC's plug-and-play routine will search for all connected devices and ask them to reinitialize. Did the PC Recognize the Scanner? In Device Manager, open the Imaging Devices branch. You should see your scanner listed there. Right-click on the scanner's name, and in the popup menu that appears, choose Properties.